Jaipur, Oct 23 (IANS) Despite criticism from various quarters, Vasundhara Raje-led BJP government on Monday tabled the Criminal Laws (Rajasthan Amendment) Bill in the Rajasthan assembly. This bill amends the Criminal Code of Procedure, 1973, and also bars the media from naming the public servant till the Rajasthan government allows the case to be investigated. 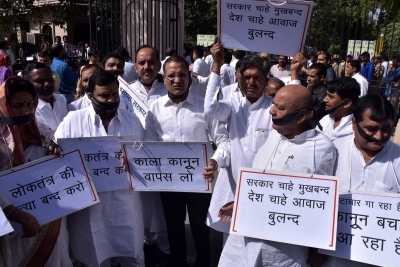 The bill was introduced by Rajasthan Home Minister Gulab Chand Kataria among uproarious scenes as the main opposition Congress walked out from the assembly. 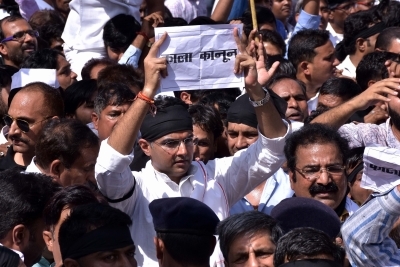 Senior BJP leader Ghanshyam Tiwari also walked out in protest of the bill. The Congress legislators raised slogans against the government and the bill in the state assembly. “We will oppose the bill,” said Leader of Opposition and senior Congress leader Raeshwar Dudi. “This will protect corrupt officials,” he added. Kataria said the government has introduced the bill as it wants the opposition to discuss it in the assembly. It may be mentioned here that the Rajasthan government through an ordinance, namely Criminal Laws (Rajasthan Amendment) Ordinance, 2017, made amendments in Criminal Procedure code, 1973, and Indian Penal Code, 1980, in September this year. The bill has certain prohibitory provisions to restrain the courts to order an investigation against a person, who is or was a judge or magistrate or a public servant, in respect of the act done by them during the discharge of their official duties. Besides, no investigation will be conducted by any investigating agency against the persons specified without there being any prosecution sanction. The sanctioning authority will have to take its decision within 180 days from the date of the receipt of proposal. The ordinance also provides that in absence of a decision within the stipulated time period, the sanction will be deemed to have been granted. It is also noted in the ordinance that no one shall print or publish or publicise in any manner the name, address, photographs, family details or any other particulars which may lead to disclosure of identity of a judge or magistrate or a public servant against whom proceedings under this section is pending until the sanction has been deemed to have been issued. Whoever contravenes the provisions shall be punished with imprisonment which may extend to two years and shall also be liable to fine.